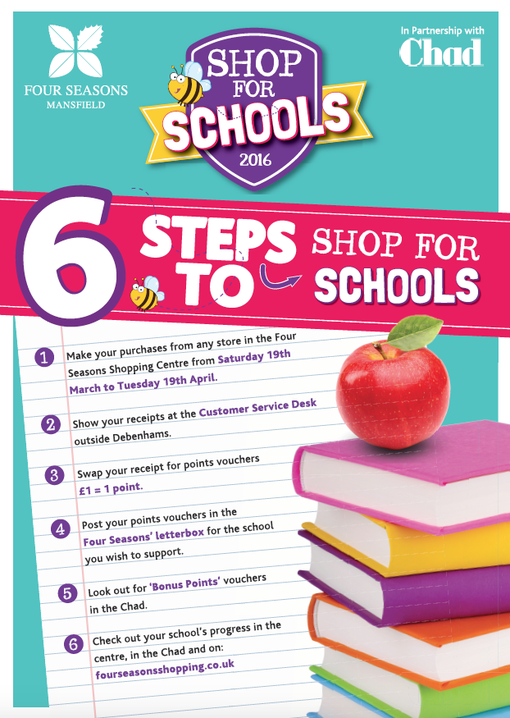 This year we have registered to be part of the Four Seasons Shopping Centre's 'Shop for Schools' scheme. All you have to do is shop in the Four Seasons in Mansfield and then take your receipt to the Customer Service desk who will give you the equivalent in tokens. Then pop your tokens into the postbox with our School name on and you've helped us gain points. The winning School will win £3000, the runner up will win £1000 and every school receives a healthy eating veg box for taking part. The competition runs from Saturday 19th March to Tuesday 19th April.